I thought I was ready for it last year, I'm definitely ready this year. At the commencement of Spring last year, I'd just come back from a tour of Napa, Yosemite and Sequoia National Parks in California. I'd eaten amazing food and gotten a better sense of what I wanted to do with my culinary life. It's funny how a little getaway can rejuvenate your senses and center you, all at the same time. This year, there has been no trip, but there has been a lot of reading, cooking looking and soul searching. I've always been an avid reader, but these days my shelves are filled with cookbooks instead of Golden Books. You may or may not know, but I am a now a Board Member of my local Slow Food Chapter. I am privileged and slightly overwhelmed with the wealth of information that finds its way to my inbox each day. It takes me a few days to sort through the junk to get to the meat of which I am responsible: our Web Site and our blog. I'm still getting used to being a gatekeeper of so much information. And truth be told, HTML scares me a little. I keep that Dummies book at my bedside table. So, my foray into becoming slow began last year during my Ice Cream, You Scream blogging event. I became hooked on the Farmers' Market and haven't been able to let go. My yearly findings came to a head when I was selected as part of Foodbuzz 24, 24, 24 for my Thanksgiving dinner. Being "slow" never tasted so good. So my entire kitchen is slow. If it's not local, I have issue with how to incorporate exotic, unseasonal things into my cooking. The best I can do is look for a local company that sells such items and purchase from there. 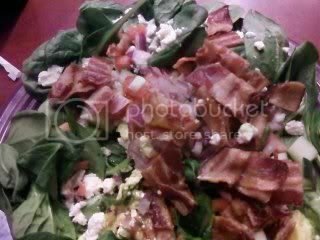 So this brings me to what I've been waiting for all winter: a good, hearty salad. I've been flush with greens from all over for weeks. I've got romaine, arugula, escarole, watercress, spinach, collards, turnips, beets, kale, chard and sorrel...just to name a few. I've mixed them all in a plastic bin and grab a handful (or five) whenever I feel the need to make a salad. When the leaves start to look a little wilted, I'll just do what any good cook would do and cook them up. This dressing is used on bitter greens, green beans, asparagus or on anything you'd like to put a walnut vinaigrette. Sherry vinegar with the addition of lemon juice in making a vinaigrette, is a great substitution for walnut oil. First, nut oils can be expensive. Second, yours truly is allergic. Remember the 3:1 ratio when it comes to making a vinaigrette into an emulsion and you can make any dressing with a little ingenuity. Combine mustard, shallots and vinegar. Whisk in olive oil or stream in, using a blender or food processor. Use salt & pepper to season. 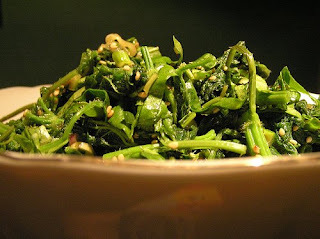 Discard any inedible parts of the greens, such as kale stems and tough ribs. Plunge the leaves into boiling salted water and cook until tender, 5 to 7 minutes. Drain, then chop into small pieces. Warm the oil in a wide skillet over medium heat with the garlic/herb mixture. As soon as it releases its flavor, when the oil has heated, add the greens. Cook, stirring frequently, until any extra moisture has evaporated. Serve. Well looks whos posting again!Love the sherry vinager tip. Courtney: Yes, I'm learning how to balance work & blogging. It's difficult, but I must if I want to succeed! That's quite a mixture of greens. So healthy. Nothing like a little salad to keep you feeling good! Egg, feta, bacon AND sherry vinaigrette? Yum! What an amazing collection of flavours! Good to see a post from you. I love your vinaigrette and your mixed green flavor. I never thought of putting paprika on greens. Sounds like your hands are full with being head slow food woman. It's such a great project to be involved with though! I love vinagrettes from scratch - forget that bottled stuff!